Download this guide in PDF. Information and cybersecurity programs are built on technology. Information and cybersecurity programs should be managed by Information Technology staff. The greatest cybersecurity threats come from outside your organization. Your IT staff would be able to detect a breach or other anomaly. Do you believe in any of these myths? If so, keep reading because all five of these statements are false. 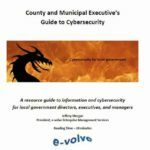 Why should municipal executives care about cybersecurity? Information and cybersecurity problems cost money. According to the 2018 Ponemon Institute Data Breach Study[i], the average total cost of a data breach is $3.86 million. Data breaches aren’t the only type of devastating cybersecurity problem and global costs for ransomware are expected to reach $11.5 billion[ii] in 2019. Malware can quickly bring a halt to your business activities and we have seen municipal services brought down for over a week because of infections that were a result of failure to follow policies and procedures. Non-fiscal consequences of information security problems may have a more significant long-term impact on your organization than fiscal consequences and may include loss of reputation and litigation. Cybersecurity incidents are a reflection of organizational management. People didn’t do what they were supposed to do (i.e. patching, backing up, checking logs). People did something they weren’t supposed to do (i.e. using inappropriate web sites, inserting flash drives, opening links on phishing e-mails). People have no idea what they are supposed to do (lack of policy, procedures throughout the organization). Knowing what your staff is doing is a basic management responsibility. Show me a cybersecurity incident, and I will show you a chain of supervision and management failures that go all the way to the top of an organization. Boards and governing bodies are beginning to see it this way too, and currently, senior C-level executives lose their jobs in roughly one-third of breaches[iii] and other cybersecurity events. Quite simply, information and cybersecurity are management responsibilities and good information security programs require ongoing management attention. Managers don’t need to be cybersecurity or technical experts; they do need to ensure that appropriate controls, policies, and procedures are in place. Your IT department isn’t the solution; management principles are. What fails in cybersecurity incidents and breaches? Depending on what research you read, somewhere between 60 and 90 percent of cybersecurity problems are caused by human error. In my experience, 90 percent sounds about right, although it could easily be closer to 100 percent. This all fits right in with W.E. Deming’s theory that 94% of problems in an organization are a result of management failures. Major information breaches occur daily and only a small percentage of these make headline news. The most infamous of these include Equifax, Marriott, Yahoo, Target, and Anthem. In many local governments and smaller enterprises, the cybersecurity programs are not sufficiently robust to even identify whether a breach has even occurred. What most breaches have in common is that technology didn’t fail – people failed. Policies, procedure, and management failed. In the Equifax breach, someone failed to apply current patches to servers with known vulnerabilities. The CEO, Richard Smith, lost his job over the incident, but he wasn’t the culprit who failed to patch. He did handle the incident poorly, though. If you take a proactive approach to cybersecurity, you have control over what you do and how you do it. However, in the aftermath of a breach, you may find your organization under investigation by the US Office of Civil Rights if the breach involved PHI and criminal charges may be involved as well. Your response may be dictated by state and federal regulators and you will have lost control of the process. A proactive approach to cybersecurity is clearly more desirable. How would you handle a breach? How would your organization be able to identify a breach? In the case of Adams County, WI the breach went on undetected for over five years and resulted in the disclosure of PHI and PII of over 250,000 residents. Five years! Would your staff be able to detect a breach? Would you know how to respond to a breach? When it comes to cybersecurity, you must know how to respond to disasters before they happen and developing an incident response plan is part of the process of building a comprehensive information security program. A disciplined approach forces you to think about everything so that when a disaster of some sort does occur, you are prepared to deal with it immediately. However, if you have taken a comprehensive approach to cybersecurity, a disastrous problem is far less likely to occur. And, if it does occur, the response and cleanup is considerably easier. Should cybersecurity programs be built on technology? Most information and cybersecurity programs are caused by people, so why are most cybersecurity programs built on technology? The foundation for a great cybersecurity program is policy and procedure. Often, when I talk to executives and managers, their response to information from me is something like, “Wow. This is great information. I’ll show it to my IT people.” This is a pretty clear indication that they didn’t hear anything I just presented. This is understandable; most managers have been conditioned to believe that information security is an IT responsibility. As an executive, you will be held accountable for a serious cybersecurity incident, especially if the problem was caused by lack of policy, procedure, and management oversight. Is cybersecurity an IT responsibility? The conventional wisdom in local governments is that information and cybersecurity are functions that should delegated to an IT Director or CIO. As is the case with most conventional wisdom, this view is wrong. Cybersecurity is often treated as a form of black magic where wizards practice their secret arts in the data center. In reality, the processes, procedures, and activities that your staff should be performing routinely are well-known and widely published. Are your staff members following these publicly available standards? Over the last several decades, many comprehensive standards and frameworks for information and cybersecurity have grown and matured. These frameworks have been developed by large workgroups of brilliant people who have devoted their professional careers to the study of information security. Local governments rarely implement these frameworks and instead rely on ad hoc programs designed by staff members untrained in information security practices and procedures. None of these standards or frameworks recommends delegation of cybersecurity to IT staff; all of them recommend comprehensive approaches that include the participation of directors, executives, and senior managers in building a comprehensive plan. The good news is that this problem is simple to fix. Building a solid, standards-based cybersecurity program is a team effort and the majority of controls that should be implemented are not technical in nature, but administrative. 2. Acceptable Use Policy. This document describes standards for using company-owned resources, ownership, reporting requirements, etc. but may also address the use of social media, work-at-home policies, and a great deal more. 3. Risk Assessment Report. Risk assessments are a requirement of every standards-based security framework. If you don’t have a relatively current risk report, your security program doesn’t meet the standards of any generally accepted information security framework. 4. Documentation. Extensive documentation demonstrating compliance with your organization’s security policy should be readily available at all times. Do you have evidence that backups are validated? Are logs checked? Excellent documentation is a required component of a true information security program. 5. Management participation. Participation of directors and senior managers in an information security program is a requirement. For most county and municipal governments, managing and understanding the scope of information and the regulatory requirements are beyond the knowledge, skills, and abilities of the IT staff. 6. Accountability. A good cybersecurity program requires participation of staff and management throughout the organization. Responsibility and accountability for the many tasks must be clearly documented so everyone understands their part. There is no reason for the existence of ad hoc information security programs, especially in the public sector. There are numerous generally accepted and widely available frameworks for building a comprehensive information security program. These are either free or dirt cheap and they describe exactly how to build an information security program in any organization. A comprehensive approach is not expensive and there are not necessarily capital expenses involved. You can use any of the following documents to begin building a comprehensive information and cybersecurity program. This is the international standard for building an information security program. It is available from the ANSI web store for $138. It is roughly 30 pages and describes exactly how to build a comprehensive security program for any organization from scratch. This framework was created by NIST (The National Institute of Standards and Technology) and it is a risk-based approach to developing a cybersecurity program. It is available for free. The HIPAA Security Rule is a federal regulation (45 CFR parts 160, 162, 164) for protecting PHI, but it can also be used as a framework for building an information security program. If you have PHI (most counties do) to protect, you could start your program by building it on HIPAA and then use one of the other frameworks to supplement what HIPAA misses. A common misconception about HIPAA is that it is an onerous regulation that is difficult to comply with. In truth, HIPAA sets a low bar and you will definitely need to supplement a HIPAA compliance program with additional policies and procedures. The membership of your governance committee should include people who are expert in various aspects of the information you maintain. For a county government, this might include the county recorder, corporate compliance, public or mental health, human resources, the county attorney, and information technology. A senior executive and a board member should also be on the committee. Risk assessment is an absolute requirement. If you have someone on the staff skilled in this, you can do it internally. If your organization has never gone through a risk assessment process, you should contract an outside firm for the first one unless you have staff members who are capable of objectively performing one. Risk assessments should be carefully scoped. A complete, current inventory of all your information assets including digital data, applications, physical information (paper records), and hardware is an absolute requirement. Most local governments don’t have this information in detail that would stand up to any kind of audit. 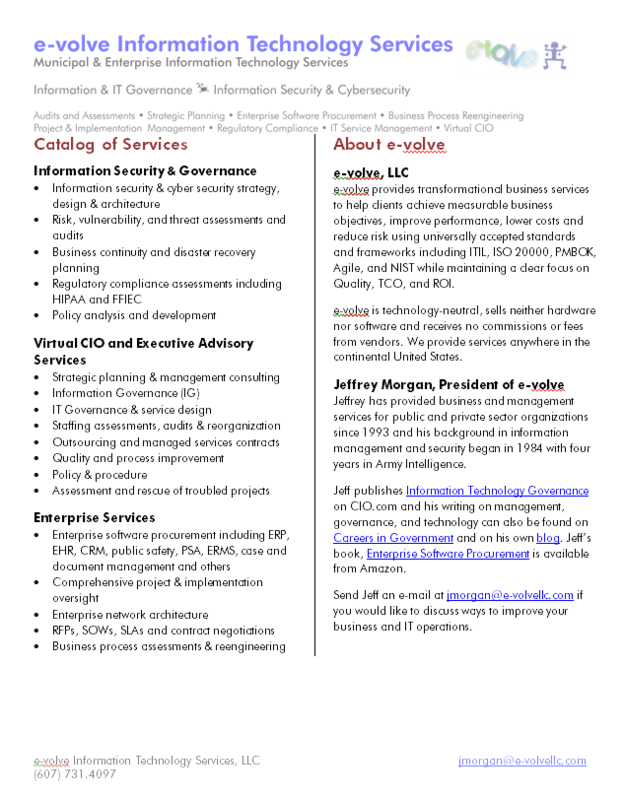 Create a comprehensive security policy. A primary responsibility of your governance committee will be to draft a comprehensive security policy that addresses your organization’s unique needs relative to risk. The policy should be approved by your governing board. You can and should build your program on any of the three frameworks described above. You’ll have to decide which one is the most appropriate depending on your unique business requirements. The risk assessment process will identify many shortcomings in your information security program. It is the responsibility of your board and senior executives to identify risk appetite and priorities for risk mitigation. How much work does it require? Does all you have read so far sound straightforward and simple? It is. There is no reason for any local government agency not to implement a comprehensive cybersecurity program. While the steps are simple, it may not be easy to implement and the problems you encounter are more likely to be administrative and procedural rather than technical. Technical implementation of a cybersecurity program is the easiest part; getting the management structure right is much more difficult. If you proceed down the path to standards-based cybersecurity, you may find that it takes six months to a year to put all the policy and procedural components into place, get a risk assessment, make a plan, and implement it, but this all depends on the availability of resources and your commitment to the project. Building a security program on standards and best practices may require no capital expenditures but it requires time and attention from managers throughout your organization. In general, local governments don’t lack the funding for technical controls and many of them already have all the required technology in place. What local governments are generally missing are clear policies, procedures, and accountability. If you would like assistance with your program, give us a call. We provide comprehensive management services for information security and can help you through every step of the process. Visit our website for more information on our services for local governments. For a detailed multimedia overview of cybersecurity in local government, watch our video, Cybersecurity, risk, and liability in local government. [i] 2018 Ponemon Institute Data Breach Study. [ii] Top cybersecurity facts, figures and statistics for 2018. [iii] One-third of data breaches led to people losing jobs. Who will be affected by the project? Who will be required to commit resources to the project? What do you hope to achieve? When will the project begin and how long will it take? Which departments, buildings and locations will be affected? Why have you proposed this project? Do you have to sell this project to your staff as well as your governing board? Even if you are the head of a top-down dictatorial management model, it makes sense to sell your staff on the benefits of the project and create some excitement and anticipation about the coming improvements to the way your organization conducts business. Staff members who feel they have been slighted or not consulted can and will wreak havoc and may sabotage the implementation of the project, so get everyone on board from the beginning. If you would like to talk about your municipal software project, or anything else, e-mail me at jmorgan@e-volvellc.com. Business Process Reengineering and software procurement projects can create political firestorms. In a perfect world, everyone would want what is best for the organization, but this world isn’t perfect. Make sure your governing board is committed to the project and is aware of the possible ramifications and risks. Large, disruptive projects require unwavering commitment at the highest levels of the organization. Official authorization for the project by your governing body, i.e. Commission, Legislature, City Council, Board of Directors, etc. is essential because it establishes buy-in at the highest level. It is also a smart political move. Your project may change the status quo in your organization and not everyone will be thrilled once they come to that realization. Changes in workflow and business processes may mean that people and departments who hold power, authority or status because of their place in the workflow may perceive that they will lose that status. The workload may be redistributed. Some departments and personnel may have more work and others, less. It will become apparent that some people are no longer required in their current positions and possibly entire departments will be reorganized or become obsolete. Those who perceive themselves to be negatively affected by this coming new order are likely to circumvent you and attempt to interfere with or quash the project.